The loss of a loved one is a traumatic experience, no matter how and when it occurs. At such a time, we need all the love and support our family, our friends and our Church can give. Below are some reflections on the role of the parish at such a time. It is not the last word, but perhaps it can give some guidance. 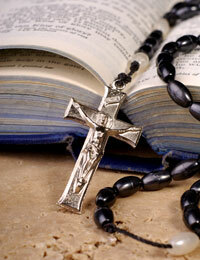 It is important to let the hospital/nursing home/hospice staff and other caregivers know that the patient is Catholic. You don't have to wait until death is near to let them know. Often, once death has occurred, the place to start is to contact a funeral home. The staff there can give you guidance on legal procedures and other things you need to know. Let them know that your loved one was Catholic. Funerals are for the living as well as for the deceased. This is especially true when different family members belong to different religions. Usually, a person wishes to be buried in his or her own church, but sometimes we need to make exceptions. It is important that the whole family can be part of the funeral. A wake or a prayer service is usually offered for the deceased. This is usually done at the funeral home the afternoon or evening proceeding the funeral. At the wake, the whole Christian community offers prayer for our sister or brother who has died. The service can be done in different ways. The funeral itself takes place in the Church. There is usually a Mass. Please talk with the priest to arrange for this. The body of the deceased should be present for the funeral Mass - if you choose cremation, please arrange to have the cremation delayed until after the funeral. Eulogies are not part of the funeral Mass (but might be arranged elsewhere). Internment (burial) is part of the ritual. Usually all those present in the Church asked to accompany the deceased to his or her final place of rest. In the case of cremation, the family can arrange for the priest to attend the internment of the burial urn. These reflections are based on the guidelines of the Catholic dioceses of British Columbia and the Yukon.